Here you will find advice about collecting data for a fieldwork project based on the Butler model. Butler, R.W. (1980). THE CONCEPT OF A TOURIST AREA CYCLE OF EVOLUTION: IMPLICATIONS FOR MANAGEMENT OF RESOURCES. Canadian Geographer, 24, pp. 5-12. Prof. Richard W. Butler's work in 1980 started a discussion about tourism carrying capacity and sustainability. He saw that tourism attractions are fragile and need to be carefully managed so that they are not allowed to exceed their capacity limits. After all, who wants to stay at a resort that feels overcrowded and over-commercialised? As Butler points out, tourism destinations carry with them the seeds of their own destruction. The trick is to manage tourism destinations so that they do not self-destruct. 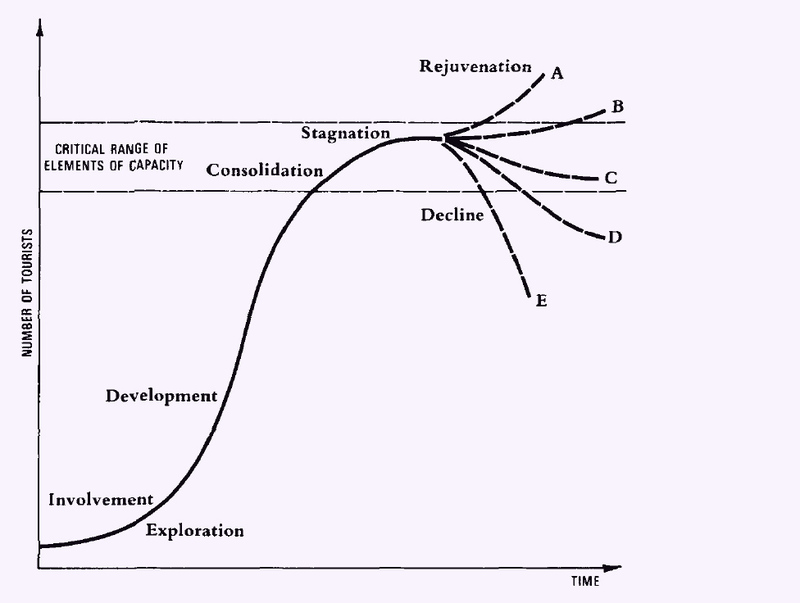 Butler (1980) writes about a tourism cycle of six stages. However, in the sixth stage Butler identifies a range of five possible scenarios that fit between complete rejuvenation and total decline. Figure 1 (below) is a copy of the original model, as published in The Canadian Geographer - beware of inaccurate interpretations. Numpty Nerd says: The tourism cycle of development provides a great opportunity for undertaking fieldwork. 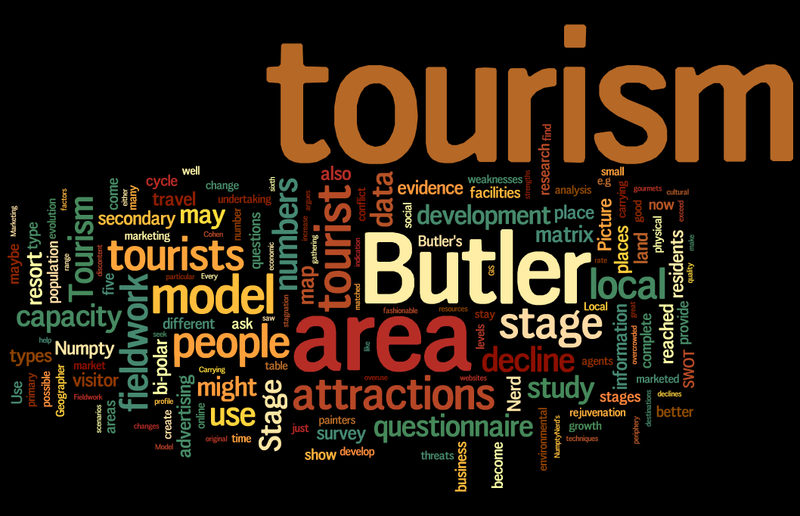 For a particular tourism area, you can collect data to locate its position in Butler's model of tourism development. Start by studying each of the stages below and then consider the types of data you might collect that are relevant to the Butler model. "Visitors will come to an area in small numbers initially, restricted by lack of access, facilities, and local knowledge. As facilities are provided and awareness grows, visitor numbers will increase. With marketing, information dissemination, and further facility provision, the area’s popularity will grow rapidly. Eventually, however, the rate of increase in visitor numbers will decline as levels of carrying capacity are reached. These may be identified in terms of environmental factors (e.g. land scarcity, water quality, air quality), of physical plant (e.g. transportation, accommodation, other services), or of social factors (e.g. crowding, resentment by the local population). As the attractiveness of the area declines relative to other areas, because of overuse and the impacts of visitors, the actual number of visitors may also eventually decline." Butler quotes the German Geographer, Walter Christaller. "The typical course of development has the following pattern. Painters search out untouched and unusual places to paint. Step by step the place develops as a so-called artist colony. Soon a cluster of poets follows, kindred to the painters: then cinema people, gourmets, and the jeunesse dorée. The place becomes fashionable and the entrepreneur takes note. The fisherman’s cottage, the shelter-huts become converted into boarding houses and hotels come on the scene. Meanwhile the painters have fled and sought out another periphery - periphery as related to space, and metaphorically, as ‘forgotten’ places and landscapes. Only the painters with a commercial inclination who like to do well in business remain; they capitalise on the good name of this former painter’s corner and on the gullibility of tourists. More and more townsmen choose this place, now en vogue and advertised in the newspapers. Subsequently the gourmets, and all those who seek real recreation, stay away. At last the tourist agencies come with their package rate travelling parties; now, the indulged public avoids such places. At the same time, in other places the same cycle occurs again; more and more places come into fashion, change their type, turn into everybody’s tourist haunt." Christaller, 1963. Based on primary tourist attractions. These maybe natural or cultural. Tourism has no economic or social significance to local residents. Emergence of secondary tourism facilities such as guest houses. A tourism season may develop. Pressure develops for governments to improve transport for tourists. High numbers of tourists that may exceed the local population during peak periods. Heavy advertising will create a well-defined tourist market. Local involvement and control of tourism declines rapidly. External organisations will provide secondary tourism attractions. Natural and cultural attractions will be developed and marketed. Local people experience physical changes to the area that they may not approve of. Tourism growth slows but the numbers of tourists exceeds the local population. Marketing and advertising will be wide-reaching. Major franchises and tourism chains will be represented. Resort areas will have a well-defined recreational business district. Tourism arouses opposition and discontent from some local people. Visitor numbers have reached their peak. Carrying capacity has been reached or exceeded. Tourism causes environmental, social and economic problems. The resort becomes divorced from its geographic environment. Artificial tourism attractions now supersede the original primary attractions. Area has well-established image but will no longer be fashionable. Fig. 1 - Hypothetical evolution of a tourist area. Butler, 1980. A: Successful redevelopment leads to renewed growth. B: Minor modifications to capacity levels lead to modest growth in tourism. C: Tourism is stabilised by cutting capacity levels. D: Continued overuse of resources and lack of investment leads to decline. E: War, disease or other catastrophe causes an immediate collapse in tourism. Holidaymakers replaced by weekend or day-trippers. Tourism facilities replaced by non-tourism activities. Hotels may become retirement homes or flats for local residents. Ultimately, the area may become a tourism slum or drop out of the tourism market completely. Requires a complete change in tourism attractions. Previously untapped tourism resources maybe found. 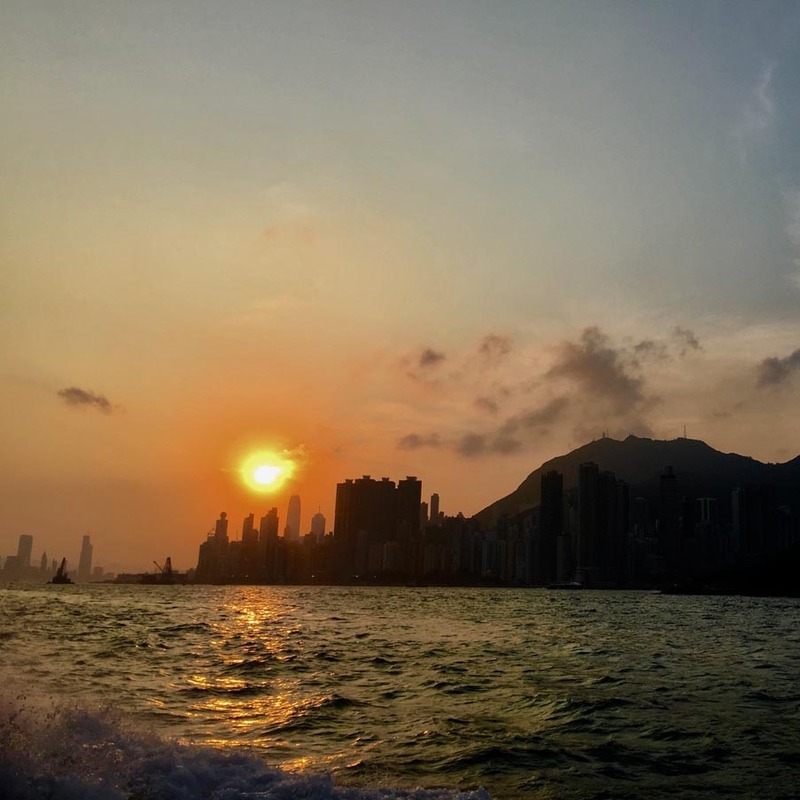 According to the 1980 Butler model, tourism areas leaving stage five, will either decline or rejuvenate - either way, the tourism area has evolved into the sixth stage of its development. It is misleading to identify a seventh stage in Butler's model. Finding a tourism area and gathering evidence to show what stage it might be in the Butler model is a great opportunity to conduct fieldwork and online research. Make life easy for yourself and choose a small tourist area. A small seaside resort or a village in a national park is likely to get you better results than ambitious plans to asses the whole of a major island, such as Bali. All fieldwork should begin with a risk assessment that is concerned with protecting your safety. Students under the age of 18 should inform their parents and teachers before undertaking any kind of fieldwork investigation. First, create a place profile of the tourism area. Gather some basic information and make some maps. Use a GIS if you can, Numpty Nerd recommends you take a look at Scribble Maps, it's free. The place profile can be structured to summarise formal (quantitative) data from governments, NGOs and business players in the tourism sector. Informal (qualitative) data can also be collected from blogs and travel websites where tourists often make candid comments about their tourism experiences. Examples include Travelfish and Tripadvisor. If people are moaning and say the resort has seen better days, this maybe an indication of decline. Use wordle.net (figure 2) to see if there are any common themes in what people say. Butler makes reference to advertising and marketing as a factor in tourism development. Looking at travel agents websites will provide you with evidence of how the place is being marketed and how widely. For example, are travel agents in countries overseas advertising the area you are researching? You can show your research on a suitable map. The way a tourism product is being marketed might provide you with evidence of the type of tourist they seek to attract. For example, is a resort seeking to boost visitor numbers by appealing to the mass market by competing mainly on price? 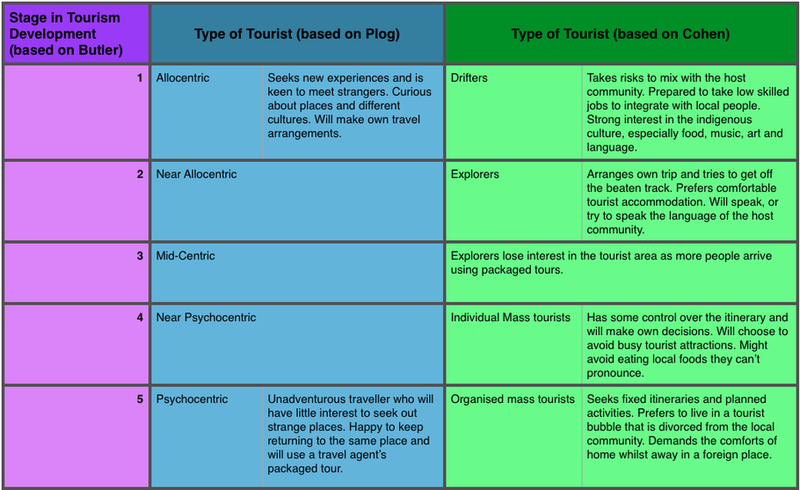 Marketing: Assess the marketing strategy to gauge the type of tourist (see figure 3). Advertising: Use travel agents advertising as evidence of the distance that tourists travel to your study area. Your aim is to gather data to assess what stage your chosen tourism area has reached. You should use a range of fieldwork techniques and avoid relying on just doing a questionnaire. Whatever techniques you use, remember that this is not physical geography - you are dealing with people, not rocks. Using inspiration from the table below, it is possible to develop your own questionnaire or interviews to find out what types of tourist visit your fieldwork study area. Obviously, you won't ask tourists if they are "allocentric or "psychocentric", but you might ask tourists if they have eaten any of the local foods. Your questions should be sensitive but will hopefully reveal something about the type of visitor to your study area. Fig. 3 - Every tourism area is different and will likely have its own unique blend of different types of people. Most tourists are close to being mid-centric. Butler refers to both Plog and Cohen who have done research on different types of tourist. Butler's assumption is that, as a tourist area evolves, the range of tourist types present will change inline with changes to the tourism area. Figure 3, the table above, is Numpty Nerd's interpretation of Plog and Cohen. However, caution and judgement should be exercised when matching these types of tourist with each stage of development. Butler is vague on this, so you have some wiggle-room here. You should also incorporate questions that are just for local residents. Here the point of your questionnaire is to find out if the local population are happy with tourism developments. By stage four of the model, Butler argues that many locals will show signs of discontent - especially if they are not getting an income from tourism. It is reasonable to ask if residents work in the tourism sector. Avoid asking how much they earn or what their exact role is. Your questionnaire will also ask how far people have travelled to your study area. Information from this question should then be mapped out as a sphere of influence or journey map. This information must then be matched with further questions about length of stay - day tripper, weekender or holidaymaker. In your analysis, this information needs to be carefully matched with the Butler model. Carrying capacity is an important part of the Butler model and this should be reflected in your questionnaire. Perceptual carrying capacity is about tourism experience and relates to the feeling that the area maybe overcrowded, or not. Your questionnaire should have questions designed to gage perceptions regarding visitor numbers and overcrowding. Your questionnaire could be supplemented by gathering quantitative data about the number of people walking down particular streets (footfall) or the number of people queuing to enter key tourism attractions. If appropriate, you might want to estimate the density of tourists on a section of beach. A land use map will provide a good indication of what stage your study area has reached. Butler states that resort areas with a well-defined recreational business district is a characteristic feature of stage four. Start with a good base map of the study area, a GIS should help. The more information you mark on the map in the field the better. After you have completed land use mapping you will need to classify land use according to primary and secondary tourism attractions. Remember also, that non-tourist land use is just as important when assessing tourism development. According to Butler, the evolution of a tourism area will be characterised by an expansion of secondary tourism attractions. Taylor your bi-polar survey to show the impact of tourism on the environment. By stage five, Butler argues that tourism will be causing significant environmental impacts. The Bi-polar survey is not a questionnaire and is best completed by the same person to ensure consistency. A common mistake is to complete the bi-polar survey only once. Ideally, you should repeat your survey many times - the more the better. Each time you use your bi-polar survey you should record the location so that you can map the scores. If you have 40-50 bi-polar readings across your study area, you will be doing well. 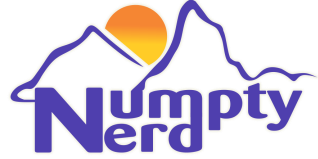 Click here to download Numpty Nerd's guide to bi-polar surveys. Relax! Stop being a geographer and get into holiday mode and step into the shoes of a tourist. Put away that intimidating clipboard that makes people wonder if you might be working for the government and start looking and behaving like a tourist. You need to experience the main tourism attractions for yourself. Plan to eat some of the local food. Soak up the resort and get a fuller, rounder, perspective on your study area. Professional geographers who conduct participant observation will normally jot down scratch-notes in a small notebook. A mobile phone is a useful tool to discreetly take rough notes which can then be expanded to write a more lucid journal as soon as you get home. Write your journal in the genre of being a tourist - don't write in an academic style. In your fieldwork report (which must be written in an academic style) you can quote short extracts from your journal as evidence. Geographers and tourists both love taking photographs - so make sure you take your camera. Aim to take plenty of photographs so that you can find the right shot to support your analysis. Take note of the 100:1 rule - for every hundred snaps you take, only one might be good enough to support your fieldwork report. Make sure you take some photographs that are suitable for adding labels and annotations. Panoramic or "pano" shots are ideal for this and will go a long way to impress whoever reads your fieldwork report. Click here for advice about boosting your grade when using photographs and captions in your fieldwork report. A SWOT analysis looks easy but can be done badly. Remember that strengths and weaknesses are the things that are already present. Whilst opportunities and threats are about what might happen in the future. Applying your SWOT to the Butler model could be tricky, so make sure you use evidence to construct your SWOT analysis. In the early stages of the model it is reasonable to expect that strengths and opportunities outweigh weaknesses and threats. In the later stages which are characterised by stagnation and decline, expect weaknesses and threats to dominate. A conflict matrix is a useful tool to summarise the relationship between different people in the local community and tourists. You should devise your own conflict matrix to suit your fieldwork location. There are many online that might give you some inspiration, such as this matrix from the Hebridean Whale & Dolphin Trust. Before undertaking fieldwork, create a provisional matrix based on your online research. When you are in the study area, use your field observations to develop the matrix. After you have analysed your fieldwork data, you are now in a position to refine your understanding of the relationships between key players in your tourism area. Source: the Hebridean Whale & Dolphin Trust. ﻿According to Butler's model, tourism generates increased levels of conflict as it develops and expands with increased visitor numbers. 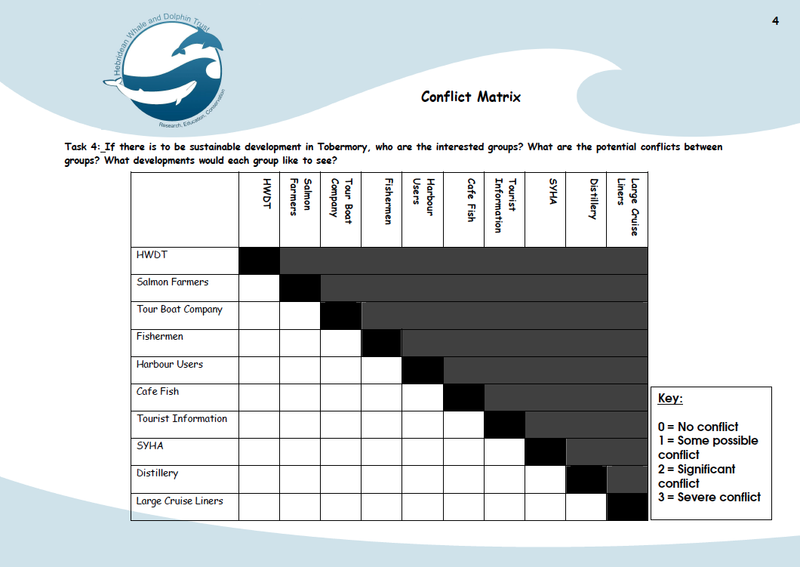 A conflict matrix provides a systematic and organised way to asses the level of conflict in a particular tourism area. Take care to consider that low levels of conflict might be due to successful tourism management. If you suspect that this is the case then you will need to consider what is being done to manage tourism to prevent tourism conflicts. It is reasonable to expect that tourism management might have improved since 1980 when Butler published his work.